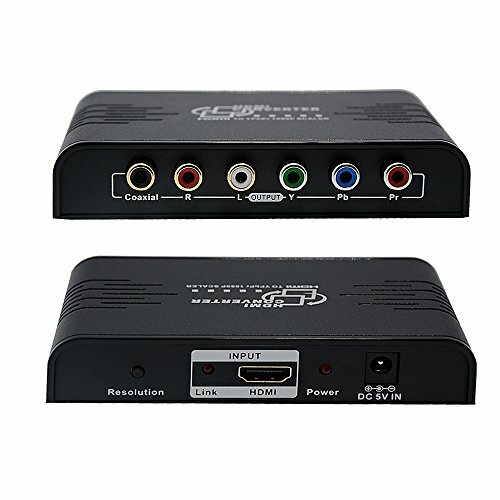 This HDMI to Component converter with scaler is designed to help user easily convert digital HDMI or DVI(using a DVI-HDMI connector, not included) signal from an HDMI or DVI enabled source to component RGB video with R/L audio, allowing the viewing of digital video to be presented on a RGB display via standard component video cable. With supreme high operating frequency up to 165Mhz and maximum bandwidth up to 1.65Gbps, the component video output images from this unit are sharp, clear and detailed with great text clarity. The device also comes with a scaler with both up-scaling and down-scaling function that will allow you to adjust the output signal to a resolution that is compatible with your RGB display. Important: Supported audio format: 2 channel analog audio, does not support digital audio May experience less than a one second lag. Will not convert audio only. NOTE Component to HDMI Converter,it can not be reverse to use. Note: kindly check your input signal is correct. This product is a HDMI to Component Converter ,not Component to HDMI Converter,it can not be reverse to use.NOTE:Any questions please do not histate to contact us by email:(ivy.wang@links3c.com),We will try our best to solve problem for you.Thank you. If you have any questions about this product by LinkS, contact us by completing and submitting the form below. If you are looking for a specif part number, please include it with your message.